A black and white photograph of a fire at Myron Vipond's house located on lot 24, Concession 6 in Brooklin, Ontario. In this view a crowd has gathered around to see the fire. Smoke can be seen coming from the house. The house was built circa 1913 on lot 24, Concession 6 in Brooklin, Ontario. In March 1954, Myron Vipond sold 70 acres of his farm at the west side of Brooklin for a subdivision by Meadowcrest Homes. Construction of the 600 homes in the subdivision began in 1955 and was completed in 1958. 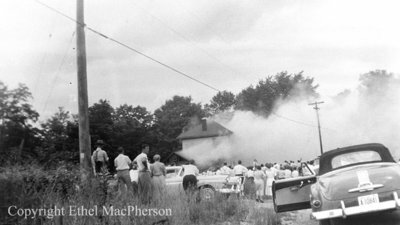 On Sunday, August 10, 1958, 14 fire departments in the Ontario County Regional Aid Association used the house to test their skills and burned it to the ground. Myron Vipond House, August 14, 1958, Ethel MacPherson. Whitby Archives 25_000_199.